I have an island in the middle of my kitchen, and unfortunately it isn't the kind with sand and surf. The island is a stopover point for groceries that haven't quite completed their journey to the appropriate drawer or cupboard. They like it here, in fact they tend to hang out for days on end. I mean what's not to like? It's a social place - the pecans mingle with pistachios, and the pasta plays with pumpkins, pomegranates and popcorn kernels. The light is good. A few of the residents have been over-staying their welcome and ended up in this island-inspired pasta. Whole grain linguine matchsticks now reside with barely cooked red kale, and a vibrant golden dressing made from a quick puree of toasted pistachios, olive oil, salt and garlic. The pomegranate provided ruby-colored accents and little pops of sweetness, playing nicely off the salt-tinged, garlic notes of the pistachio dressing. I knew I wanted to make a pasta dish of some sort, and the pasta I had on hand was an organic sprouted whole grain linguine. As a side note, I'm a fan of the taste, texture, and nutritional profile of Food For Life Baking Company's Ezekial 4:9 cereals, and was curious about their pasta(s). Whole grain pasta needs just the right thing to go along with it, and I had a nice, big bunch of beautifully colored red kale on hand. It had big, voluminous leaves that maintained a bit of structure after a quick dunk in boiling water. This worked well - breaking up the flat pasta nicely. You can certainly use another type of kale if you like, but try to choose a fresh, lively bunch with hearty, substantial leaves. Save a couple large kale leaves to garnish your serving platter. Bring a large pot of water to a boil. While the water is heating, break the pasta into 1 1/2-inch segments and make the pistachio sauce by pureeing 1/3 cup of the pistachios, garlic, salt and olive oil with a hand blender or food processor. Set aside. Once the water is boiling, salt it generously and cook the pasta per package instructions - be careful not to overcook. At the very last second, add the kale to the pot of boiling water, and IMMEDIATELY drain the pot. 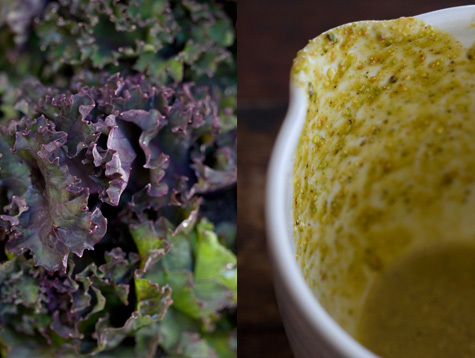 You don't want to overcook the kale to the point that it is listless. Run cold water over the pasta and kale, using your hand to work the cold water through the kale and pasta. Toss gently with a spoonful of the pistachio sauce and now spin the pasta and kale dry in a salad spinner to toss off any remaining water. Just before serving, toss the pasta with a big spoonful of the pistachio sauce and 1/2 of the pomegranate seeds, taste and add a bit of salt if needed. Turn the pasta out onto a platter lined with a couple kale leaves (optional), and sprinkle the remaining pomegranate seeds and pistachios on top. Finish with another drizzle of the pistachio sauce if you like. 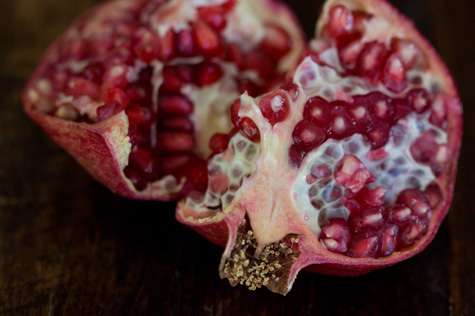 *An easy way to de-seed pomegranates is to break them open into a big bowl of water. A lot of the membrane floats to the top. This sushi bowl recipe is simply a de-constructed sushi roll - brown rice, tofu, avocado, toasted nori and green onions served with a simple citrus-soy dressing. Simple and delicious. A unique and flavor-packed pasta recipe. Whole wheat pasta noodles, olives, kale, pine nuts tossed in a pan for a tangle with a garlic-charged harissa and olive oil sauce.